Pioneer travelers began crossing the meadow-filled valley that would later become the site of Las Vegas in the early 1800s, replenishing their water supplies from springs and creeks, and although the area was named in 1829, the first permanent (non-native) structure did not appear until 1855, when, with the help of the local Paiute tribe, a group of Mormon missionaries led by William Bringhurst built a fort, beside a minor drainage just north of the modern city center. The place acted as a major transit point along the cross-country route between Salt Lake City and southern California. 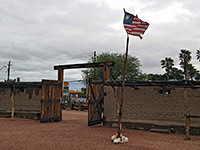 The Mormons stayed for less than two years but the fort was subsequently used for short stays by other groups, including a company of US troops during the Civil War, and was later enlarged once acquired by prospector and businessmen Octavius Gass, in 1864. The buildings passed to the Stewart family in 1884, and to a railroad company in 1902, by which time the fort was part of a small but fast-growing settlement. 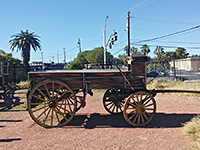 In subsequent decades, ownership changed several more times, until the site gained protected status as Old Las Vegas Mormon Fort State Historic Park, established in 1991. 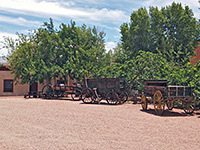 Most of the 19th century structures are long gone, but have been placed by replicas, including brick walls, guard towers, verandas and wooden fences, yet some traces of the earlier adobe walls remain, incorporated into reconstructed buildings, and the fort contains plenty of historic artifacts - most contained within a museum, others, such as wagons, in the grounds. So although the majority is not original the place does look and feel authentic, and its central location and low entry fee ($1 per person) ensures plenty of visitors, year round. The park is open every week from Tuesday to Saturday, 8 am to 4:30 pm. 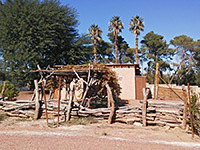 The state historic park is situated on the east side of Las Vegas Boulevard, just south of the Washington Avenue junction, one mile from Fremont Street in the downtown area, and adjacent to the Las Vegas Natural History Museum. The creek that once flowed past, originating from Las Vegas Springs to the west, disappeared some time ago because of pumping of the water at source; instead a replica has been installed, flowing along a concrete culvert through a short corridor of trees on the south side of the complex. 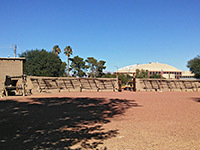 The fort was centered on a square stockade, enclosed by walls 14 feet tall and 150 feet long, with towers at two of the corners and a row of buildings along one side, and this arrangement has been retained in the restored version; the central quadrangle is lined by adobe walls to the north, and partly the east and west, with a square guard tower at the northwest corner, and a residential block to the southeast. 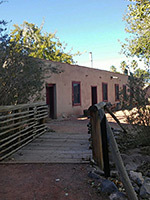 Beyond the main wall is a smaller enclosure, originally the corral, encircled by wooden fences, and another building (a bastion), while to the east are the museum and the main entrance.